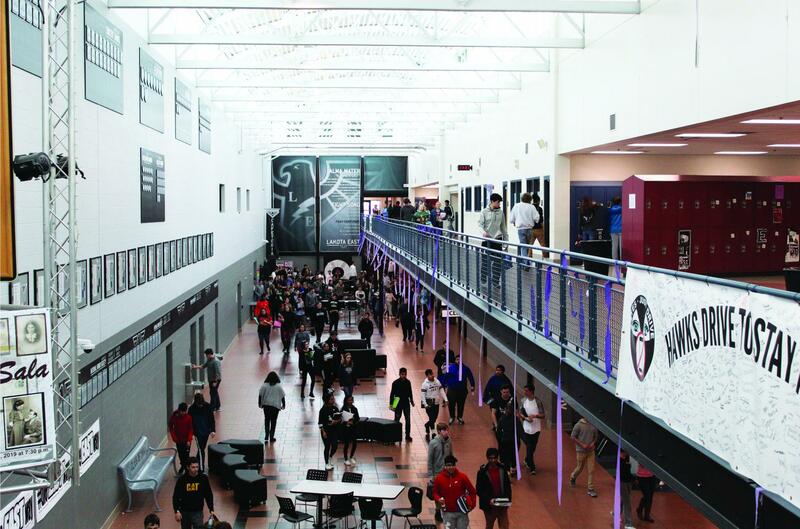 Administrators at East have altered the bell schedule for a second time this school year, after receiving complaints from teachers and students about confusion over timing and overcrowding in some lunch periods. East’s lunch periods were shortened by five minutes in order to create a passing period for students leaving the lunch room. Previously, students entered and exited the lunch room at the same time, causing congestion in the hallways. In a recent Spark survey conducted of 110 students, 67 percent said they believe that East is overcrowded and 71 percent said they have not had somewhere to sit during lunch due to the congestion. East junior Bailey Betz agrees with both of those statements. At the beginning of the year, Betz used main street seating and flexible learning space when her lunch got too packed. But that option was taken away by administration due to ‘mishandling’ of the space by some students. 57 percent of surveyed students preferred last year’s bell schedule to the current one. That schedule allowed for three lunches on a regular day rather than four. East Principal Suzanna Davis said the downsizing was a byproduct of the overall schedule revamp in order make more time available during the school day. “It was an opportunity for [the administration] to gain instructional time and passing time to give students time to process and decompress throughout the day,” Davis said. The time created from the downsizing was used to extend students’ passing periods and redistribute the time allotted for lunch. This gave students a 35 minute lunch and a 15 minute study hall relative to last year’s 30 minutes and 20 minute study hall, which 70 percent of surveyed students preferred. The recent shortening of the lunch period was in response to those student preferences and concerns from teachers regarding when their students were supposed to be back in class. East Latin I and III teacher Sarah Elmore said she was also confused about the timing surrounding lunch, but the administration swiftly cleared up the misunderstanding.